The Oculus Quest and Oculus Go are the new kid’s on the block, but can they beat the Rift? Lets just make it simple Oculus Go as much as the price out shines Rift or Quest at $179 32gb and $279 64gb even at entry level this headset will disappoint in many ways and that starts with the 3 point of view vs 6 point of view sensors to Rift and Quest and only one controller mouse vs 2 handheld controllers Rift and Quest. Okay need I say anymore? Now lets get to the meat of Rift and Quest. In 2018 the Oculus Rift virtual reality headset had far more competition than when it launched, and much of it comes from Oculus VR’s other virtual reality products. While the Go is more of an entry-level headset, the Quest has the same price tag as the Rift, and many unique features which make it a worthy competitor for its older brother. To find out which is the best VR headset, we pitted the Oculus Quest vs. Oculus Rift in a classic head(set) to head(set) battle. The Oculus Rift is the older of the two designs and though it does show, it’s not an antiquated device. It sports a similar fabric-coated exterior to the Quest, a similar tri-strap adjustable head mount, and built in audio. But it’s not identical to the Quest. The Rift is lighter by a full 100 grams, due to the onboard hardware of the Quest, which includes its own processor and battery for wireless operation. That does mean that the Rift trails wires, where the Quest does not, making the latter a much cleaner-looking headset, especially considering its newly revamped front plate, which wraps around the corners where the four Oculus Insight tracking sensors are located. Instead of over-the-ear headphones like the Rift, the Quest comes with similar audio to the Oculus Go — a spatial audio solution hidden in the head strap. That makes it easier to hear what’s going on in the environment around you, whilst still being fully immersed in your VR experience. It’s not necessarily better quality, but it certainly makes it easier to remain present in both the real and virtual worlds. 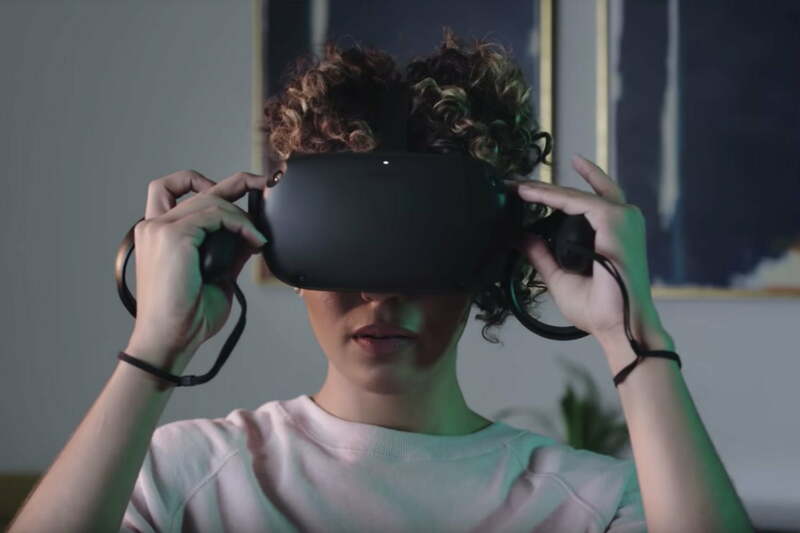 The Oculus Quest is the most powerful standalone headset Oculus VR has ever produced, packing a Qualcomm Snapdragon 835 processor with onboard graphics, 64GB of onboard storage, and a battery that gives it between two and three hours of life per charge. As impressive as that all is though, it falls well short of what the Rift can offer, since the wired headset is tethered to a gaming PC. Oculus suggests much higher minimum specifications and the ceiling is far, far higher for potential performance than the Quest’s — think RTX 2080 and 2080 Ti graphics cards. Yet no matter how powerful the PC you hook it up to as well, there’s no concern about battery life, since the headset is powered by your PC via a wired connection. 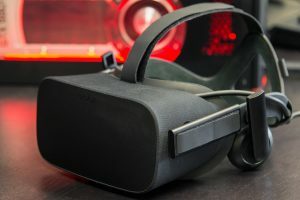 Although that means that the Rift is capable of running much more detailed virtual reality scenes than the Quest — and for longer — its display has fewer pixels. The Rift’s dual-OLED panels are limited to 1,080 x 1,200 pixels per eye, working out to 2,160 x 1,080 resolution in total. In comparison, the Oculus Quest has twin OLED displays that are 1,600 x 1,440 each, or 3,200 x 1,440. That makes for sharper overall visuals, with a noticeably reduced screen-door effect on the Quest, but its in-game textures, shaders, and models are a far cry from the Rift’s PC-powered visuals. The Rift handles high-speed motion better than the Quest too, because while its displays are a lower resolution, they have a higher refresh rate. The Quest runs at 72Hz, while the Rift has a fixed 90Hz. That should make it more comfortable for the user too, helping to avoid the dreaded VR nausea. Both the Rift and the Quest offer high-end virtual reality tracking and inputs, but they take a very different tack with it. The Rift uses the classic external-tracker design using Oculus’ Constellation tracking cameras. Although they aren’t as capable a tracking solution as the HTC Vive’s Valve-developed Lighthouse trackers, they are perfectly capable of offering roomscale tracking in spaces up to 8ft x 8ft with three sensor set ups and more with four. The Rift’s external trackers mean it’s possible to track the controllers almost anywhere you place them, whether that be behind your back or under objects — as long as they remain in the field of view of at least one camera. In comparison, the Quest offers a theoretically unlimited tracking area thanks to its use of “inside-out tracking,” Insight sensors on the headset itself. One is located in each corner for a total of four and they scan the environment around the user, tracking their location and movements within it, as well as the motion of the controllers. Oculus debuted what it described as “arena scale” tracking at Oculus Connect 2018, where a number of Quest users walked around a tennis court-sized gaming area at the same time without any major tracking problems. This was further enhanced by the headset’s lack of any wired-tethers, letting users roam freely without being tied down. However, the controllers must remain within the field of view of the headset’s wide-angle sensors in order to remain tracked. Early testing suggests their field of view is wider than the user’s, but tracking behind the back, or when the user is leaned in close to something, is unlikely to be possible at this time. Each headset provides a full six-degrees of freedom to the wearer, tracking positional movements, as well as tilt and orientation of the headset, but each solution has its strengths and weaknesses. Controllers are much the same for both. The Rift uses Oculus’ now classic Touch motion controllers which provide trigger, grip, and gesture inputs, and the Quest uses a modified version of those with a relocated tracking ring. Each provides for nuanced, detailed, inputs into virtual reality with the use of both the wearer’s hands. Having been on the market for more than two and a half years, the Oculus Rift has a library of games, VR experiences, and 360-degree media numbering in the low thousands. It has a variety of supporting marketplaces and ecosystems, including Oculus Home, Steam VR, and VivePort, and a robust developer and user base that all but guarantees continued support and growth in its content catalog in the future. The Oculus Quest, on the other hand, is brand new and isn’t even set for release until Spring 2019. As it stands there are a handful of bespoke applications and experiences being used to demo the new hardware and there will no doubt be more when it is eventually released. But Oculus VR is said to be hoping that developers will port their existing Rift games to the Quest to help flesh out its library of content. Although we would be surprised if the Quest didn’t have a decent spread of applications at, and soon after, launch, the Rift is going to have the more robust catalog of titles for some time to come. There’s no denying that the Oculus Quest represents the future of consumer virtual reality in many ways. It’s entirely wireless and untethered, has a reliable and borderless — if still imperfect — tracking solution, and sports a more detailed display than its older sibling. In comparison, the Oculus Rift can feel quite antiquated with its chunky cable tether, its reliance on external sensors, and a defined tracking area. When combined with its requirement for a powerful gaming PC, it’s a much less intuitive and forward-thinking VR experience. Yet with think the Rift is the better option. It’s not going to be the headset of the mainstream in the future and it’s going to feel increasingly dated in the years to come, but if you have a gaming PC, there’s a better VR experience to be had right now with the Rift. For the $400 that both headsets cost ($399 for the Rift with three sensors) you get access to a ton of content on the Rift, today, and its visuals, although less crisp, are much more richly detailed, run at higher frame rates, and are not restricted by battery life. The cable tie is a drag — literally at times — and we would expect a second-generation Rift to adopt many of the exciting new features of the Quest, but for now, the Rift is still the more high-end VR solution. The only real must in this setting is having a decent gaming PC. If you do, buy the Rift, if you don’t and don’t plan to, waiting for the Quest is probably a better bet. The overall reason I am interested and vested in VR and these headsets is we are evolving into a new platforms with Sansar and High Fidelity and having the right gear in mind just makes sense. No this does not mean Second Life is dead! But it does mean we have other choices to enrich our online world experience although still in its infancy VR headsets will be our new standard years down the road. However many won’t transcend with the new technology as easy.